Thanks to all who attended the “S&OP Innovation Summit” which took place at the Planet Hollywood in Las Vegas, Nevada. This conference brought together the leaders and innovators from across different industries to provide insight into supply chain processes. That was a great opportunity to meet our Westernacher Consulting experts to discuss your specific requirements. 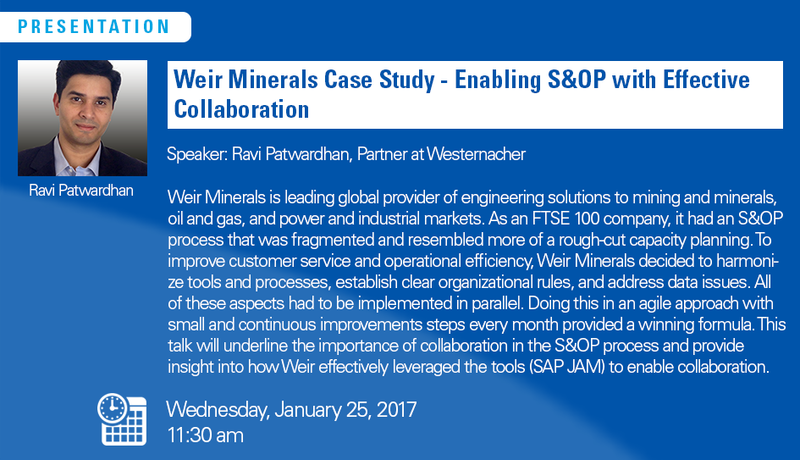 As trusted SAP partner, Westernacher was involved in the early deployment of SAP IBP for S&OP, implementing as one of the first a full cycle IBP S&OP solution in the discrete industries. Attendees had the chance discuss their requirements with our experts to find out how to continuously optimize their processes. The “S&OP Innovation Summit 2017” brought together senior operations and supply chain professionals, with more than 20 industry speakers and over 150 delegates. Through keynote presentations, panel sessions and networking discussions, attendees could cover a breadth of topics on S&OP and Supply Chain insights to be able to improve efficiency within the company and drive overall business performance.